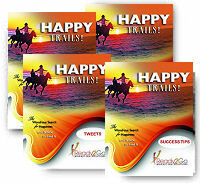 Success Tips: Happy Trails - The Wondrous Search for Happiness and Where to Find It from Ready2Go Marketing Solutions, Inc. Choosing Your Happiness - Are you happy? No really, I'm serious. Can you say with 100% certainty that you're TRULY HAPPY? Or are you like most other people, just getting by? Are you waiting for the end of your day so you can slump home, veg in front of the TV, and forget about work? Are you working toward some fuzzy, future goal in the hopes of one day finding fulfillment? We've all been there. At some point or another, we've all hit a rhythm of trudging along, head down, getting through it. But some of us stay in that trench for far too long. However, that's just one story. You can choose to write a new one in which you're bright-eyed, enthused about life and fulfilled by your endeavors. Define Your Happiness - What brings you joy? Is it being in good physical condition? Does falling in love do it for you? How about beautiful adventures in exotic locations? Take time to reflect upon and determine what qualities or life experiences make a happy you. Move Towards Your Chosen Life - Start creating the happy life you just defined. Take steps toward your bliss activities. Sign up for personal training, plan a vacation, or take a class to meet people and learn something new. You've got to keep moving. Let Go - Once you're moving toward the things and exchanges that make you feel happy, it will be easier to see what's dragging you down. Let go of those things. It might be challenging, as people want to hold on to what they've known...but it's okay. Let go, and create space for even more joy to show up. Happiness is not a trait reserved only for select winners of the genetic lottery. It's available for everyone...but you must choose it. Step out of the shadows, and choose to live in the light. You deserve it.